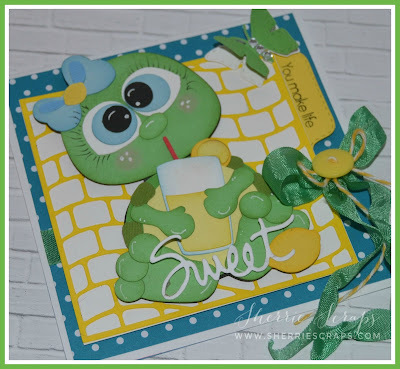 Very sweet card! The turtle is absolutely adorable! I love the colors you selected for your card too! Super adorable ...especially love the squinty eyes!!! Oh my gosh this little turtle card is absolutely adorable!!!!!! Oh wow.. too cute Sherrie!!!! LOVE it all! And I hope you have a very well relaxed vacation my friend! Take in the sights and relax and just enjoy that quality time spent with your main squeeze!!! Thank you for linking up this week in our FFC! This is precious, Sherrie, and your choice of colors is wonderful! Love those big blue eyes and long eyelashes.Thanks for sharing at Jo's Scrap Shack! Oh, this is so cute! What an adorable little turtle, and the sentiment is so fun! thanks for playing with Jo's Scrap Shack. 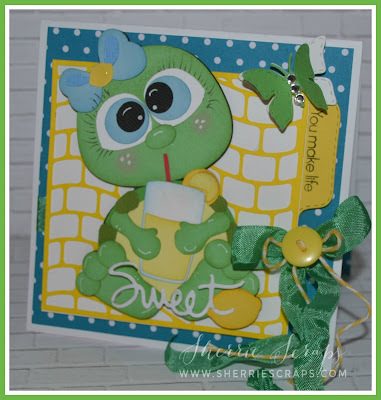 Super cute Sherrie! That little turtle is darling! Love it's cute expression! This is so turtley awesome!! I love it. I hope you are having a fab time on your vacation. Oh lucky you have fun in the sun! This is so adorable I love it! I really love the eyes in particular the lashes so cute! Sorry I haven't commented lately life has been...well crazy. My father passed away and then my niece died from an overdose so it has been all about family. O gosh, this is truly adorable! 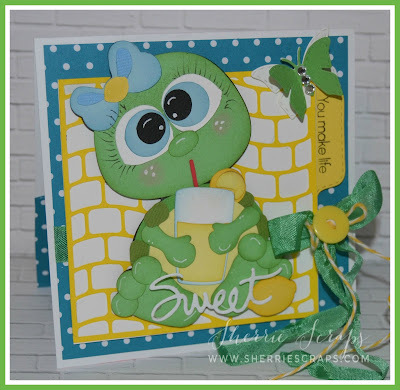 Such a sweet little turtle and such a fabulous detailed design! Love it! Hope you have a wonderful time on your vacation! Oh my gosh, this so makes me smile, Sherrie!! I'm so happy to be back and visiting your blog to see the gorgeous projects I've missed while I was away!! That turtle is just so cute!! I love her big blue eyes and eyelashes!! So sweet!! The layers and details are fabulous!! Oh my gosh, I'm exhausted after the trip!! It so didn't go as planned as we were originally headed to San Diego, but severe storms in Texas and New Mexico pushed us north. So we spent the time in the Rockies. Estes Park is so amazing...a beautiful village high in the mountains. It was a little disappointing that the road through the National Park was closed due to snow, but it was Elk mating season and we saw them everywhere...they even wandered through our campground!! I hope to post pictures later this week but first, sleep!! Then laundry ;) I can't wait to hear all about your trip, too!! I hope you took lots of pics!! Have a wonderful evening, my dear friend!! Missed you!! Love the adorable turtle!! Super cute card!